The residents of a London borough care home are going through a bit of a technology revolution. 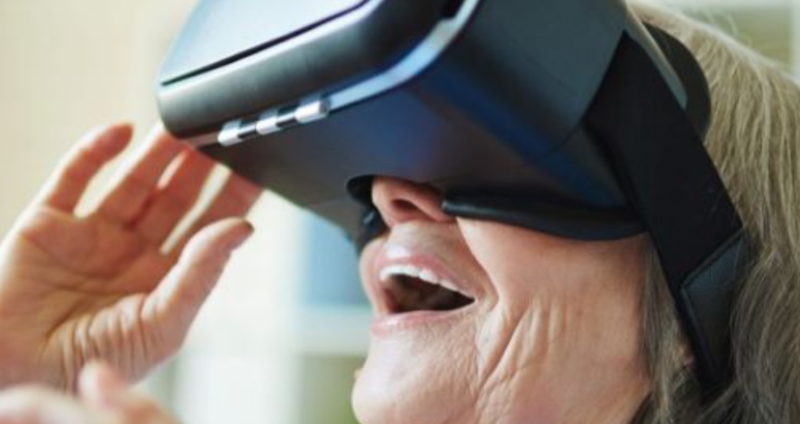 Canford Healthcare, who are currently partnered with The Digital Line (TDL) to bring technology and new innovation into the residential care space, have followed on from their ground-breaking work with voice assistants to introduce a new set of virtual reality experiences in conjunction with VR/AR pioneers, Infinite Mixed Realities (IMR). “This morning I was sitting at the foot of the Himalayas and I still had my slippers on!” one resident told me as she was enthusiastically eating her lunch. TDL delivered a series of short VR experiences through mobile headsets that took the residents on different journeys to unique locations, which would otherwise never have been available to them. George R Vaughan, one of the directors at The Digital Line is fairly confident this technology will become commonplace in social and residential care within the next ten years. Vaughan said, “It’s a fact. We’re all getting older and we’re all going to live longer. In the near future, I can foresee a time when residents will be provided with a “Digital Menu” as part of their daily activity sessions, offering technology enhancements to supplement their physical programs. “It’s really like the next level of existing services such as Netflix or Spotify. They could provide a virtual day trip to the Great Wall of China, a skydive from 30,000 feet or something as simple as a leisurely boat trip down a Venetian canal. “Many of us will already be familiar with these experiences but to a certain demographic they are still way out of reach and resigned to the realms of science fiction – or “witchcraft” as one resident joked with me! To date, feedback from the residents – and the care workers – has been universally positive. Corinna McCann, co-founder of IMF, was the woman behind the VR experiences and was instrumental in getting this service to the residents. “When we heard about the idea we were immediately on board. 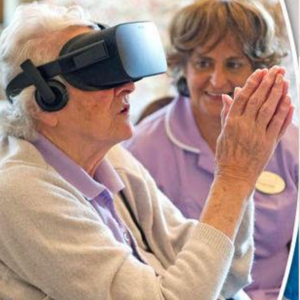 Being able to offer the elderly and bed-ridden an escape through the medium of VR was such an exciting concept. We prepared a series of gentle, wellbeing experiences that helped the viewer to relax, taking them away to places such as a gentle spring brook or a calming, beach oasis. “Historically, universities and businesses have dabbled with isolated research projects in this field but what The Digital Line is looking to encourage takes the tech opportunities for the elderly onto another level and we are very proud to be a key partner. Canford Healthcare should be applauded for their vision to properly integrate technology into the lives of their residents. “Voice activated assistants, VR/AR experiences and even ground-breaking work with Emojis and dementia patients are just some of the fascinating projects they are putting into practice as living, working systems that have quickly become a part of the residents’ lives. “IMF has already looked at the feedback from these residents around VR and an overwhelming number of those who used it have asked for new experiences such as a flight into space or a safari trip so we are currently hard at work to deliver these. In conjunction with other major tech companies, TDL is now exploring the opportunity of creating interactive, virtual spaces through VR that will allow residents to revisit familiar, personalised locations from their past in an effort to stimulate thinking and memory.